Micromax India just announced Superphone A50 android smartphone. 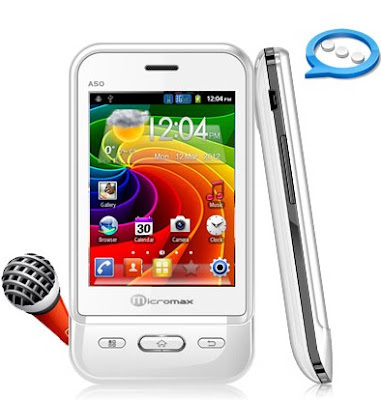 It has 3.1cm Capacitive touchscreen, 650MHz processor, 2MP Camera, 3G, WiFi and GPS. The micromax superphone A50 sports android 2.3.6 Gingerbread with official Google Play store. The most notifying feature about this phone is AISHA - Artificial Intelligence Speech Handset Assistance. What that means is you can control your phone by your voice. Control includes sending message, making calls, browsing the internet and also getting information on weather. AISHA is powered by Dexerta, a company that bought iris to life. This might also suggest that it might require an internet connection or an active WiFi connection for AISHA to perform. Not sure how much that is going to work in India. It will retail for about 4999 RS which is very good if you look at the specs of the phone plus it has G-Sensor. Micromax is calling it Superphone Ninja.